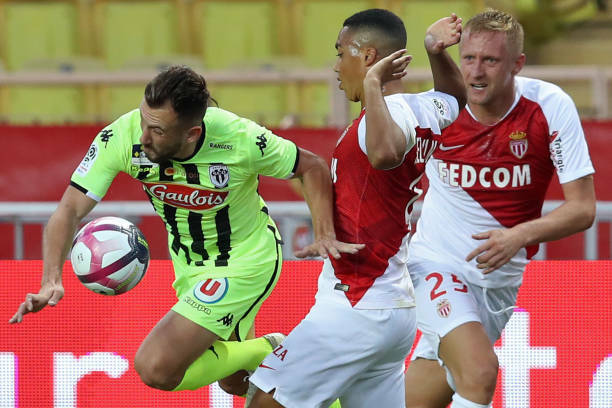 Monaco has failed to build their momentum in Ligue 1 has they suffer a 1-0 defeat against Angers at Stade Louis II. Anger striker Stephane Bahoken’s first-half goal gave the visitor the lead. Monaco have now won just once in their first eight matches of the new season after failing to produce the required response following Friday’s 1-1 home draw with Nimes and a Champions League defeat by Atletico Madrid. Angers, who ground out a goalless draw with Toulouse on Saturday, started brightly as Bahoken headed wide. The visitors continued to press as Flavien Tait and Cheikh N’Doye both put good chances off target before goalkeeper Diego Benaglio saved Baptiste Santamaria’s long range shot. Cameroon frontman Bahoken finally broke the deadlock on 27 minutes. Angers got clear down the left through Tait before he clipped a pass back into the penalty area. Bahoken showed good close control to dig the ball out and fire a shot over Benaglio into the roof of the net.